Mark Zuckerberg just took to a presentation where Graph Search was announced to a lot of excitement, at least amongst Facebookers. Dubbed "the third pillar" of Facebook, alongside the News Feed and Timeline features, Graph Search is the internal search engine of the social networking giant. Based on Microsoft's Bing tech, of course. "Graph Search is designed to show you the answer and not links to answers," seems to be the motto with which Facebook will differentiate itself from Google, though Mountain View has been doing a similar thing with G+ results. The new "pillar" is a way to make sense and use more thoroughly the ragtag information Facebook users, and especially your friends generate all day every day - to make sense of all those photos, comments, likes and check-ins for the next time you need something specific. It is basically a more curated approach to search, going through people you might trust most, or who share your point of view and interests, and you know the way they think and function, so next time you need to go to San Fran, you search who of your friends lives there, so you can crash on the couch. We kid, but the idea is to ask things in a natural and more intuitive way, based on what is basically a bunch of filters for your friends' interests, whereabouts, workplaces and so on, from where you can derive useful information. Graph Search seems to be in an early stage of development, so for now you can look for things like people (with priority given to your top contacts), places, photos and videos (organized by themes such as weddings or best party shots, for instance, based on the comments), as well as people's interests, so you can quickly find those available for Pirates of the Carribean 5 moviegoing at this very moment. The blue Facebook bar we are used to seem replaced with a search field, and natural language processing is used for the questions, so you don't have to focus much on the way you type it in. You can use it for just connecting, though, like asking for friends of friends who are single and happen to be in the city you'll be visiting, and you can further refine by education and so on. 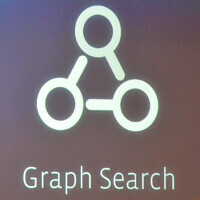 Sounds promising, but we'll see how it does in practice, you can check it out right now at facebook.com/graphsearch. Oh, and on the question will there be an API for 3rd party apps to integrate in their services, the CEO answered: ""We want to work with any company as long as they'll honor the privacy of the folks on Facebook." Crickets. Congrats, ur mom'll be proud of u ! The Website Ahead Contains Malware! Google Chrome has blocked access towww.phonearena.com for now. Even if you have visited this website safely in the past, visiting it now is very likely to infect your computer with malware. Malware is malicious software that causes things like identity theft, financial loss, and permanent file deletion. Learn more. What's going on PA? This isn't the first time something like this has happened either. I would say google's traversing some of the links that the spammers post on the comment section and some of them redirect you to sites with malicious software. We know of the issue, and it has been fixed. It was just some bad code from one of our ads. Unfortunately, Google is slow to fix these warnings on their side. Sometimes it takes them days/weeks despite complying to all requirements. We've been thru this for many client websites who access ftp from compromised machines which result is all sorts of files being uploaded to account. Besides this WP itself needs constant update ... i have seen many indentity theft mails coming from WP installs.Did you also submit to stopbadware.org? Not sure, I'll check with the higher-ups. Thanks for the tip! i'm having the same malware message,is google piss ? soon Google will copy this Idea ;) as usual, Google copy and "improve"